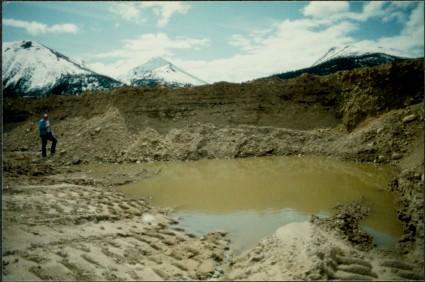 Photograph depicts an unidentified man standing to left of large puddle in gravel pit, mountain peaks in background. Photo speculated to have been taken on the plant, or near the Cassiar airstrip, facing south west. Stamped annotation on recto of photograph: "JUN. 1987". Context of photo was determined by individuals who contributed to Northern BC Archive's Facebook Photo ID Project, contact archivist for more information in research file pertaining to this photograph. Item is part of the Cassiar Asbestos Corporation Ltd. fonds. Image is one of three, see also items 2000.1.1.3.18.12 and 2000.1.1.3.18.13. Original accession no. : this photograph was found in "Engineering Box", folder C.